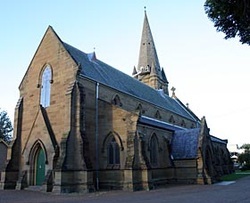 Maitland became a parish in 1838 and is one of the oldest parishes in the Diocese of Newcastle. The first St Mary’s Church was designed by James Hume and situated between the present Church and the Rectory. Completed in 1843, with a seating capacity of 300-400 persons, it was designed to be functional rather than architecturally attractive. With a growing population, the question arose about enlarging the Church Building. The Colonial Architect, Edmund Blackett, said that it was too costly to enlarge and repair and so proposed a new building to seat 700 persons and built on an ecclesiastical plan that would look like a house of God. The foundation stone was laid in 1860 but the bell tower was not completed until 1887. Locally quarried Ravensfield stone was employed for the main body of the Church. Detailed carved cedar formed the pews, pulpit and altar rails. The familiar details of a Blackett Church can be evidenced – for example, six bays of arches in the Nave and pointed windows, uniform in appearance yet delicate stone tracery is unique in each one. Guided tours of St Mary's can be arranged. Morning/Afternoon teas can also be provided.